The plan for milestone 1 is to build the basic system of the drawable stompbox. 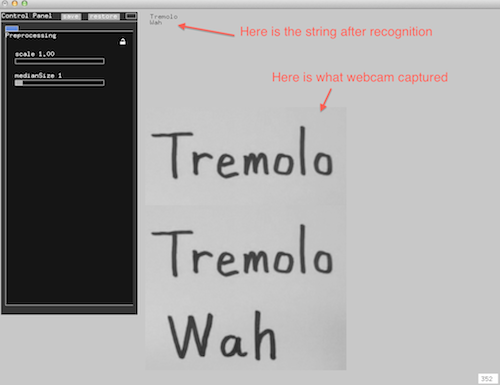 First, letting the webcam to capture the image of what you have drawn on paper, then the computer can recognize the words on the image. After making a pattern comparison, the openframwork will send a message to puredata via OSC. 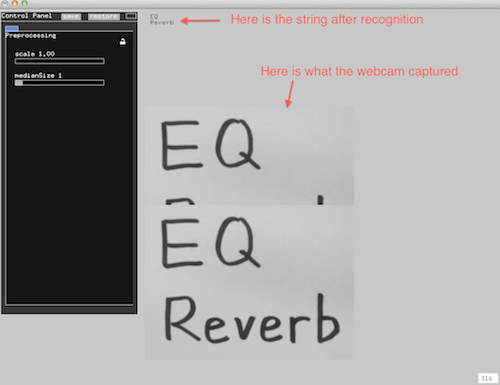 Puredata will find the right effect which is pre-written in it and add it to your audio/live input. 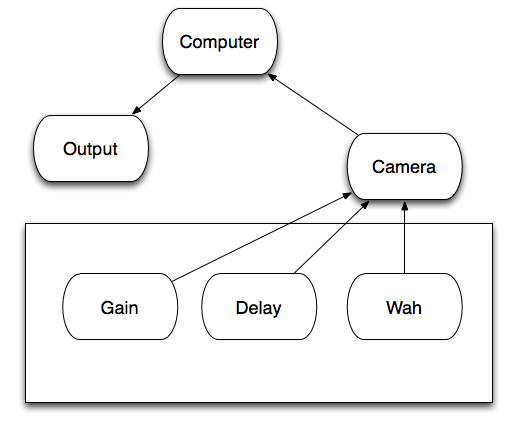 After writing words on a white paper, the webcam will take a picture of it and then store this photo to cache. 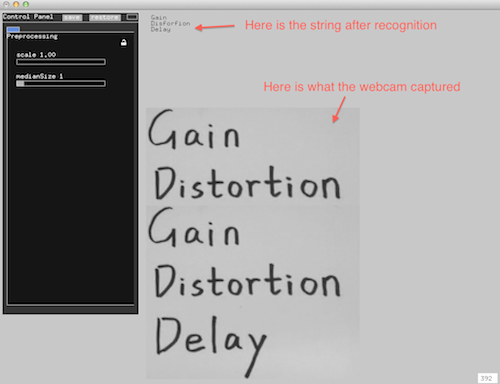 The program in OpenFrameworks will load the photo, and turn the word on the photo to a string and store it in the program using optical character recognition via Tesseract. The string will be compared to the Pattern library to see if the stompbox you draw is in the library. If it is, then the program will send a message to let PureData enable this effect via OSC addon. You can use both audio files or live input in puredata, and puredata will add the effect what you have drawn to your sound. 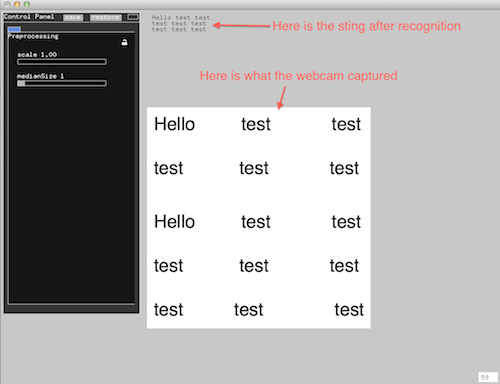 After a number of test for OCR, the accuracy is pretty high but not perfect. Thus a pattern library is needed to do a better recognition. 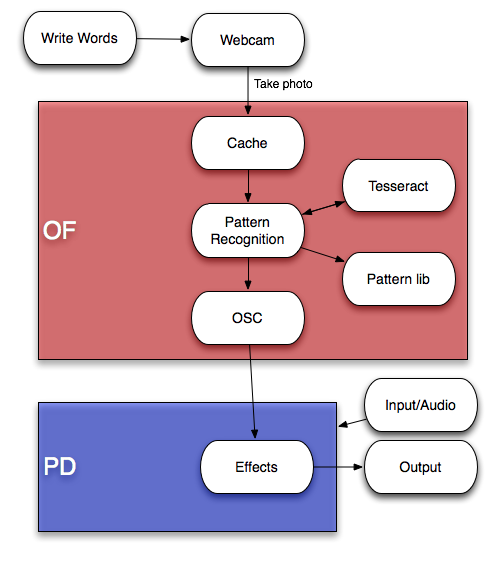 For example, Tesseract always can not distinguish “i” and “l”, “t” and “f” , and “t” and “l”. 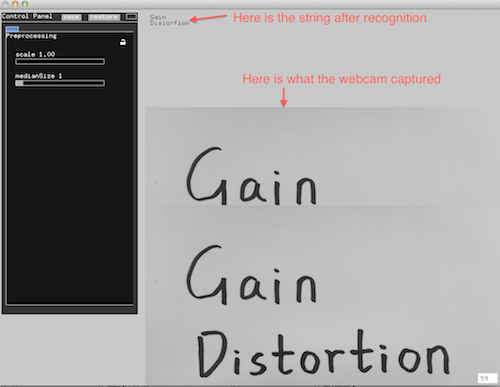 So the library will determine what you’ve drawn is “Distortion” when the result after recognition is “Dlstrotlon”, “Disforfion” or “Dislorlion”. 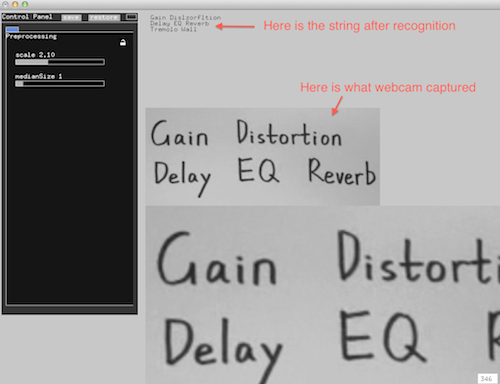 Until now, I’ve made five simple effects in PureData, which are Boost, Tremolo, Delay, Wah, and Distortion. Hybrid Instrument Final Project Milestone 1 from Haochuan Liu on Vimeo.